Tasting Notes: Subtle spice and apple with a wonderfully smooth tea finish. 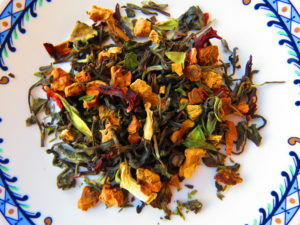 Our Fat Burner wellness tea is a powerful blend created especially for those who wish to cut body fat! This blend includes the most powerful teas that are proven to cut fat naturally and easily in the body, making it a fantastic weight loss blend, helping you overcome sugar cravings, and is also beneficial for lowering unhealthy levels of cholesterol in the body. What sets our Fat Burner blend apart from other weight loss tea blends is that even though we’ve blended the most powerful teas together, the flavour is pure, and wonderfully delicious! The most popular powerful teas for weight loss are; pu’erh tea, white tea, and oolong tea. These specific organic teas are known to clean the body and help reduce excess weight quickly! Pu’erh tea is a unique weight loss tea produced from fully fermented tea leaves- it is pro-biotic, and earthy. Pu’erh has been popularized worldwide as a weight loss tea, and used as a main ingredient in specially prepared tea blends. It has a great reputation as a healthy drink and an aid in weight loss. White tea is one of the most powerful sources of antioxidants found in nature. Antioxidants reduce the accumulation of cholesterol in the bloodstream and increase metabolism in the body. White tea has naturally powerful thermogenesis (calorie burning) properties. The thermogenesis mechanism oxidizes fat and maximizes energy expenditure. Loved for centuries in Asia, and studied in the Western world, white tea is widely known to provide powerful fat burning properties. All of these teas help burn fat, speed up the metabolism and have the ability to detoxify the body of harmful chemicals. They contain caffeine, catechins, polyphenols, flavonoids and amino acids. All these components have fat burning properties! The ATR Fat Burner blend is an excellent aid in healthy weight loss, and maintenance when paired with healthier food choices and discipline. It also boasts different health benefits such as reducing cholesterol, cleaning the skin of troublesome acne, solving skin problems, and improving general well-being.